Alienware’s Graphics Amplifier breaks new ground by opening laptops to desktop-class graphics, but you’ll have to be a serious gamer to justify the bulk and expense of the transplant. One of the biggest drawbacks of owning a gaming laptop is the fact that they’re very limited when it comes to upgrades. Sure, you may be able to swap out the hard drive and add some RAM, but the graphics card? You can fuggedaboutit. To fill this need, Alienware has developed what it calls the Graphics Amplifier. Essentially, it’s a $299 box with a power supply and a PCI-Express slot in it that allows you to soup up your Alienware laptop with desktop graphics card. Desktop GPU processing power with a laptop? Yes, please. We got to check out the Alienware Graphics Amplifier at a private briefing, so here’s what we think, and what you need to know. 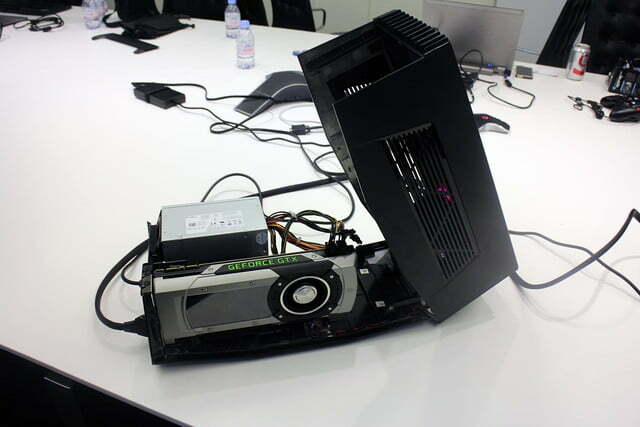 As soon as we walked into the conference room that Alienware was briefing us in, we spotted the Graphics Amplifier immediately. It’s unlike any PC accessory we’ve ever seen before. Desktop GPU processing power with a laptop? Yes, please. That’s not to say that the Graphics Amplifier is flashy or attractive, though. It’s encased in a gray and black rectangular cage with vents along the sides and rear. 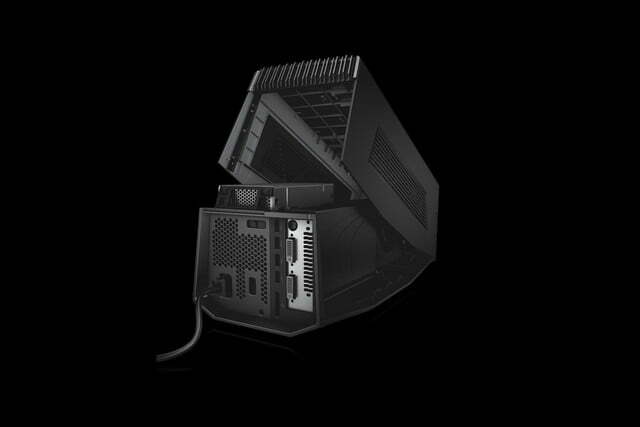 The front panel also contains vents, as well as an Alienware alien head insignia, which lights up. We thought this was the power button, but that’s not the case. 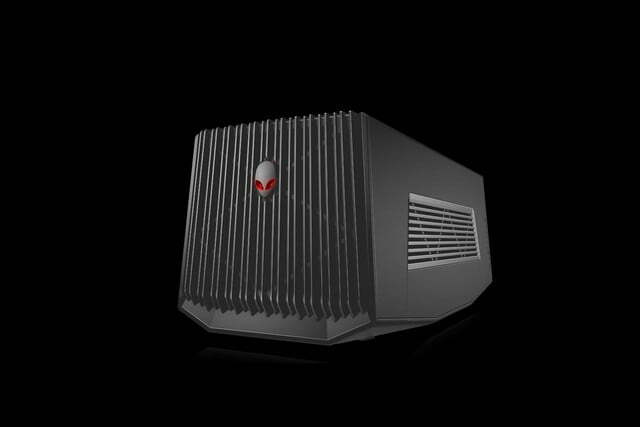 Though the Alienware Graphics Amplifier might not be an eye-catcher, it at least matches the visual theme of the company’s systems. The Graphics Amplifier isn’t exactly portable, measuring 6.8 x 7.3 x 16.1-inches, and weighing 7.7 pounds. That’s without a card inside it. However, its bulk does come with one big benefit. You can fit almost any graphics card inside the amp. The lone exception likely is the AMD Radeon R9 295X2, a dual-GPU monstrosity that comes with its own liquid cooling system built in. However, Alienware says that it is working with AMD on this issue, so perhaps a version of the card will be released later on that can be housed in the Graphics Amplifier. 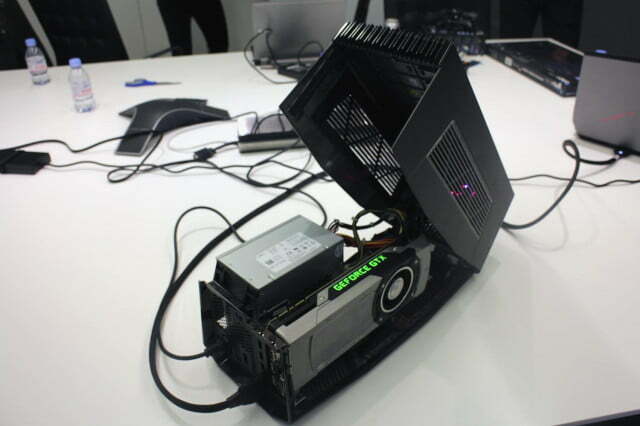 Prepping the Alienware Graphics Amplifier for liftoff is a piece of cake. It ships with a 460-watt power supply inside, so you don’t need to bring your own power box. However, you do need to supply the graphics card. The Alienware Graphics Amplifier is awesome. If you have any experience building or upgrading PCs whatsoever, servicing the Graphics Amplifier will be old hat. 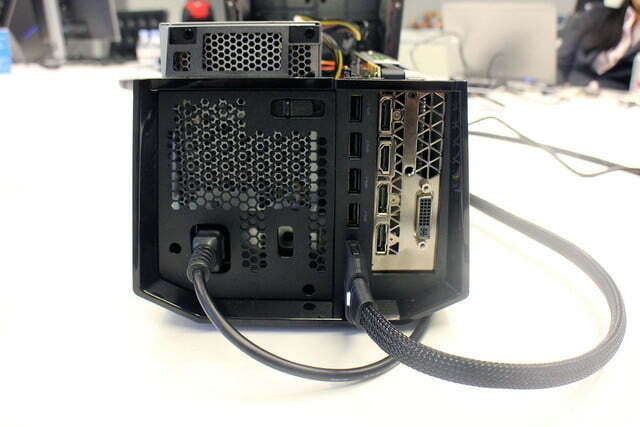 You start dissecting by lifting the case up from the back, which reveals the PSU, and the cavity where a card will go. 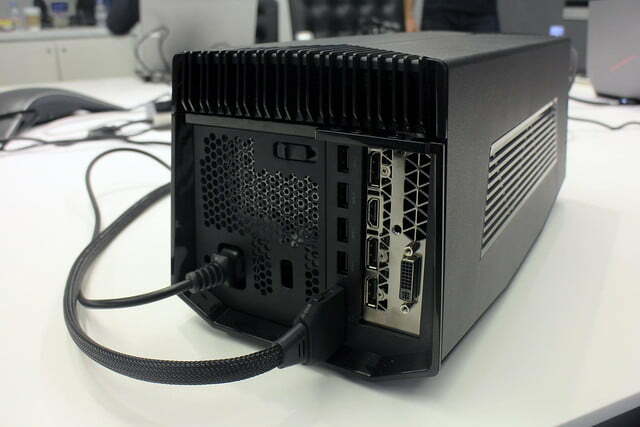 The unit has a PCI-Express slot inside, so all you need to do is insert a card in there, and plug in the power connector that runs from the power supply into your card. Close the case up, plug it into the back of your Alienware 13, and voila, you’re done. 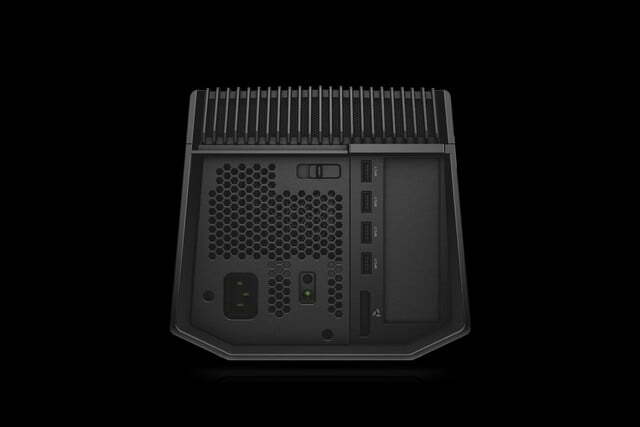 The Alienware Graphics Amplifier doesn’t just supercharge your Alienware with desktop GPU processing power, though. Around back, you’ll find a bunch of ports, so it serves double duty as a hub for extra connectivity. Here, you’ll find four USB 3.0 connectors, and whatever connectors are found on the back of the graphics card that you install in it. This means that you can go for a multi-monitor setup here, if you wish. Keep in mind that the Alienware Graphics Amplifier connects to a special port that will only be available on Alienware laptops now, and going forward, starting with the Alienware 13. We asked Alienware whether the port will appear on non-Alienware laptops, and we didn’t get an affirmation, or a denial. So, if you’re a fan of other gaming laptop makers, keep your fingers crossed. For now, however, expect them to only appear on Alienware’s notebooks. What kind of performance boost should you expect? So, as we said, desktop graphics cards are generally more powerful than their mobile counterparts. But just how powerful? 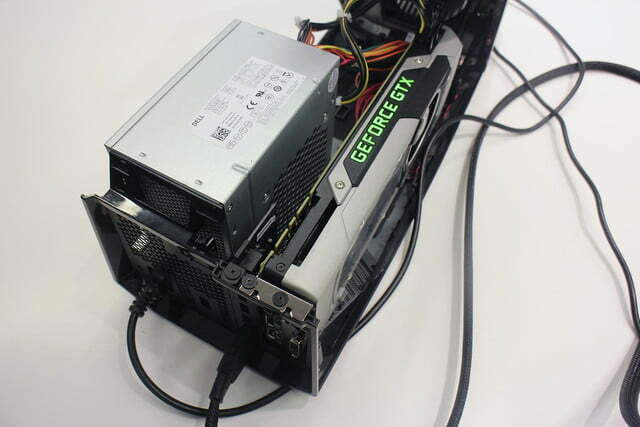 Consider the example of the Nvidia GeForce GTX 980, compared with the GeForce GTX 980M, both of which were released in the last month and a half. Future desktop graphics cards will only be more powerful than their predecessors. According to independent tests that Digital Trends has conducted, the 980M provides roughly 75 percent of the power that the 980 does. That’s quite impressive. 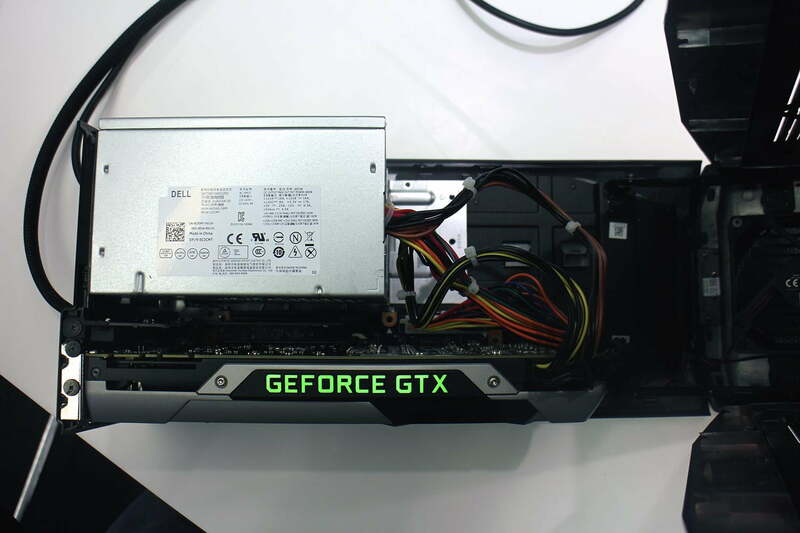 But the Alienware 13 will only ship with the Nvidia GeForce GTX 860M, a previous-generation GPU. That’s disappointing for the Alienware 13, but that does give you more of a reason to shell out for the Graphics Amplifier. If Alienware continues to support it, the Graphics Amplifier will also outlive both the laptops and the graphics cards it works with. Think about it: Future desktop graphics cards will only be more powerful than their predecessors. The Alienware Graphics Amplifier supports Nvidia GeForce GTX 600-series graphics cards, and AMD Radeon HD 5000-series components. 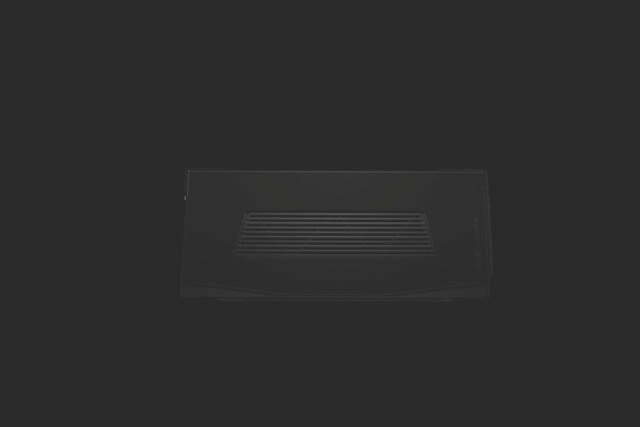 The Alienware Graphics Amplifier fills a practical need, and addresses an issue that has plagued gaming notebooks since their inception. By giving PC gamers the ability to add desktop graphics to a mobile system, Alienware’s newest creation gives you the power to stave off that dreaded time when you’ll need to plunk down four figures for a new gaming notebook, which is never fun. Though the Alienware Graphics Amplifier is awesome, it’s a bit pricey, carrying a price tag of $299. You’ll be able to order one starting October 28, and it will be available worldwide “this holiday season,” the company says. In the meantime, look out for our full review of the Alienware Graphics Amplifier, which should go up sometime in the coming weeks.